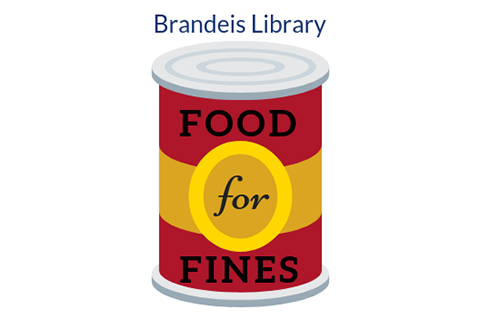 Students can now pay Library fines with donations to the Brandeis Food Pantry. The Brandeis Library announced borrowing policies that reduce or eliminate fines for overdue materials. As part of the new approach, the Library partnered with the Brandeis Food Pantry to launch a Food for Fines program. Food for Fines allows students to pay off their fines with donations of non-perishable food or hygiene items. Each item donated is worth $5 toward Library fines. We will be happy to accept additional donations at any time if you have them. The Brandeis Food Pantry is located in the Graduate Student Center Conference Room (Kutz 102). More information about the pantry and its hours is available on the Brandeis Food Resources page. Student Union President Hannah Brown ‘19 agreed the revised fines structure is a step toward making the Library more accessible and improving the student experience on campus. Because fines have a different financial impact on people, the new Food for Fines program will help remove those barriers. "Food for Fines provides people with more options to pay off their fines and allows you to give back to the community," she said. "There's a moral to it rather than just a punishment."